I've never been one to have resolutions, really. But for some reason this year feels different. It's not because I'm against them or anything. I just know myself and after a few weeks of "gung-ho"ness, I'll eventually taper off and only disappoint myself. I didn't make any last year, but goodness, was last year life changing regardless. Isn't that what resolutions are for anyway? To make life changes? That just goes to show you that we are inevitably not in control- whether I made any resolutions or not, God had big plans and they happened. And I'm really ok with that. We had amazing triumphs and blessings mixed in with immense sadness and sorrows...yet, looking back over the last year I'm still in awe of Him and His mercy and kindness. He is a big God and although sad things happened, the beauty and blessings that those things birthed really calms my soul. After reviewing 2013, I really want to go into 2014 with some future "hopes" and "disciplines" for myself. I really want to give it all I've got and allow God to really transform me; my heart. I know He does't need me to do this, but I really want to...you know? Use my real camera. With the visit from my friend Michele, I was just totally refreshed and encouraged camera-wise. Listen, I'm lazy. And if I can get away with shooting things with my iPhone, I will. It's fast and it's easy. It's also "cheating", as we ended up calling it. So, this year I will force myself to really learn my Canon, play around more and more with it, and let God use that talent He's given me for His glory. Whatever that should be. No Pinterest or blogs for recipes; cookbooks only. This one scares the crap out of me. Just being honest here. I love Pinterest and am so easily inspired by everything I see. BUT the truth is, by only being inspired by other bloggers, the recipes we all end up seeing on the internet are just different versions of themselves! Time to start contributing brand new stuff. Also, I am very easily discouraged upon visiting and can more often than not leave feeling "less than" or like my recipes and blog posts just can't compare. So, I'm going to wean myself from this dependency and do things the old fashioned way- good ol' cookbooks! I have SO many of them anyway...good ones! Great ones actually. With 1,000's of recipes I want to try. So get ready friends, for that. Eat clean foods. I guess if I'm perfectly honest, I sort of do this every year come January. But then...come Fall...it's carbs, sugar, frostings, baked goods, and so on GALORE! The Lord has blessed me with a healthy body, and I want to care for it accordingly. I never, under any circumstance want to take it for granted. With the passing of my friend Stephanie, I know how fragile our bodies really can be. So, I choose to (once again) try my best at clean eating. Real, honest foods. Pursue Jesus with my whole heart. This one is a no brainer, but for some reason always gets pushed to the back burner as soon as things get crazy in life. Which, as we all know, doesn't really make sense and shouldn't be the way things work. Jesus first, husband second. Jesus first, then work...Jesus first, life later. I'm tired of frantically trying to figure out a way to fit in a devotional. Tired of feeling bad come the end of the night when I was "too busy" and just couldn't get in any time with Him. He needs to be first Christina. You know this. So, this year I really want to strive to put Him and all things Him first. Then the rest will come. Invest. Invest. Invest. In people that is. We're called to make disciples. Which means me, too. I'm not exempt. Having a blogging/internet based business can easily make for introverted social skills. I really love being a hermit, and could seriously live all my days at home with my kitties and husband. Friends can come as they please, of course. This, obviously isn't a good thing. The Lord has blessed me with the gift of blogging, so I need to shine Him with it. He's blessed me with amazing friends through blogging- so I need to shine Him through that to them! But, He has also blessed me with the gift of family members and friends close by...and I really need to invest in them, pray with them, pray for them, love on them, and disciple them. I was reading Titus the other day and the very first verse got me thinking, "How would you describe your purpose in life? To what are you devoted? Are your willing to share your faith, teach the truth, and live a Godly life for all to see?" Will you pray for me about these things? And also, should you have prayer requests- please comment below with them! Let's be an amazing Christ-centered community! Love these! I'll be praying for you for each of them, especially number 4. If you're like me, when that gets done, everything else truly does fall into place. I'm sharing next week on the blog how I do daily devotions! You should share, too. I really do love seeing how others practically work out their relationship with the Lord! These are all such fantastic resolutions! #2 is a great one, but yes totally scary... I've had The Joy of Cooking staring at me from my counter for months now but I'm so intimidated by the lack of pictures. But your post has inspired me to just go for it! I will certainly be praying for you & these resolutions... thanks for sharing a bit of your heart! I didn't make resolutions because like you, I always end up just feeling bleh about them shortly into January. I'm working on some intentions set for the new year (learning new things that aren't academic, being present in the moment, etc.). I'm hoping intention setting will overcome my resolution give-up! I love the goals you've set, especially about cookbooks. I just recently started turning away from Pinterest for recipes, and I'm amazed by all the new ideas I've found in my old trusty books. Good luck with your recipe hunting! And good luck to you!!! These are great! Especially 4 and 5. I also had on my list (and my vision board) to live my life and share in the glory of God. Sharing Him, His meaning, and the Spirit. It is definitely one thing that I need to strengthen in this year. These are so great! I think I have these same goals, I just haven't written them down. I just got a new cookbook for Christmas too! I can't wait to get started... even though I have no idea what I'm doing. But that's usually how I do things anyway. OoOOoooh! What cookbook did you get??? I'm a sucker for two things: cookbooks and aprons! I can't get enough! Can't wait to see what 2014 has in store for you friend! These are all wonderful! I just posted my goals for myself this year, and I think putting them in writing makes them a little more real! I definitely need to use my real camera more often. There are way too many weeks (even months) where it goes unused! I think I sometimes just feel awkward taking it out when I'm out with friends, and I need to just get past that! Putting them in writing TOTALLY makes them more real! And kind of makes an accountability thing, because now all your readers know! Hehe. There's way too many people to disappoint now! Good luck with the cookbook goal! It will be difficult, but I understand what you're saying! 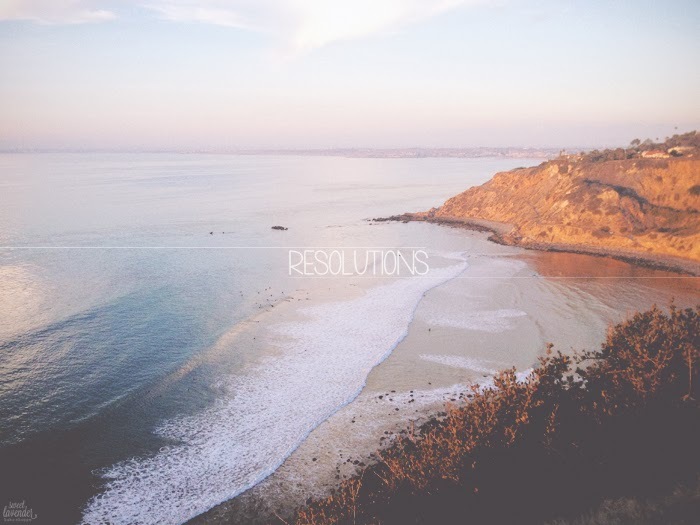 My goals this year (for some reason I don't like the word resolution) all involve expanding myself creatively. Doing craft shows, trying new craft styles and mediums. It's so easy to get caught in a cycle of doing the same things and this year I want to challenge myself! Oh wow! Those are great goals! I get so many compliments on my cross stitch mixer it's not even funny. So good luck to you- you're going to do great! Incredible goals! I can totally relate and agree with each of these you mentioned, especially excited to start #3 myself this year. Praying for you and thanks for your honesty with those out there following ya! Totally excited to start #3! And can I just tell you, I have had two pizza nights since! >:( Granted one night was homemade and the other, I didn't partake in pizza eating (I got a salad) but still! It's really hard to eat clean when bad foods are so yummy! Ha! This literally made me giggle out loud! Good luck, friend!!! GREAT resolutions. I'm hoping that with my iphone break-up, a connection with my "real" camera will organically occur. gosh. I love all of these. very good list. Love this! Way to keep it simple yet so focused. I just got my very first DSLR and I'm loving it!! Looking forward to learning about it. Yes, yes, yes to the recipes thing. One of my goals is to try more recipes (I'm horrible about taking a basic idea and just"winging" it) and one of the things looped into that goal is to go through my cookbooks. I have one that my Uncle made me that has all of my Granny's recipes from her old green cookbook that she wrote down and I really want to cook more things she wrote in there.